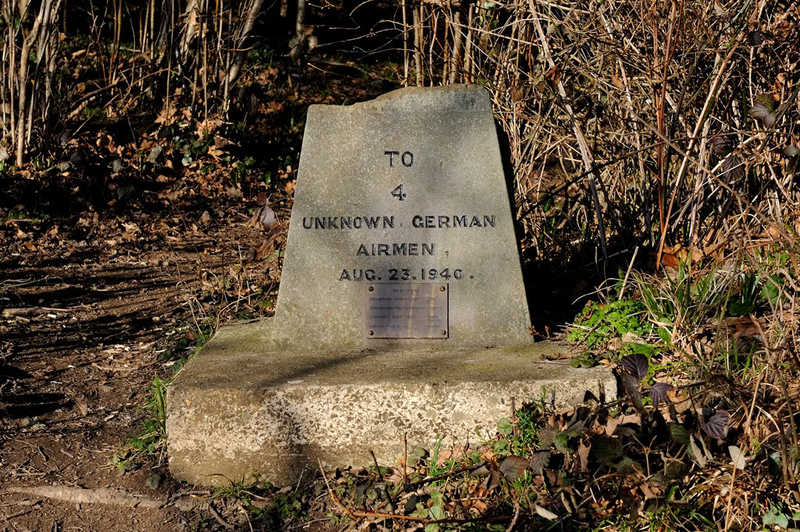 This memorial is located next to a Hampshire By-way and remembers the crew of a Junkers Ju 88 crew (I/KG54), which was shot down during the Battle Of Britain. The memorial is located some two miles away from the aircraft crash site and is incorrectly dated, as the aircraft was brought to earth on 21 August 1940 at 2.15pm. The crew were all killed and the aircraft burned out. Spitfires of No 234 Squadron from Middle Wallop made the interception, the pilots being Squadron Leader O'Brien & Pilot Officer Bob Doe. P/O Doe visited the site of the crash and was horrified when he saw the remains of the crew and the results of the interception, he vowed there and then never to go and witness the outcome of such an action again. An element of mystery surrounds the crash as there appears to be no known burial place for the crew. Their remains were removed from the site in the back of an army truck, but no one appears to know where they went or what became of them. Efforts to raise a memorial in the village to the crew after the war have not materialised. However, in the summer of 1951 Mrs Flora Firbank of Hoplands Estate offered her land to erect a small memorial. This is the memorial we see today and is located below the flight path of the Ju88 at the end of its final flight.